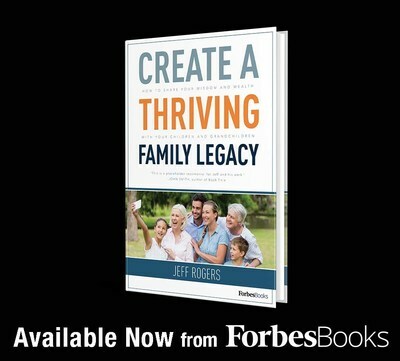 NEW YORK, Jan. 8, 2019 /PRNewswire/ -- Jeff Rogers, financial advisor estate tax and legacy-planning expert, today announced the publication of Create a Thriving Family Legacy: How to Share Your Wisdom and Wealth with Your Children and Grandchildren. The book is published with ForbesBooks, the exclusive business book publishing imprint of Forbes Media. A family business legacy can endure for generations if wisely planned. But legacies are not limited to buildings named in one's honor or large sums finding their way into worthy charities. A powerful legacy can be a spirit or ethos that lives on in one's family including the values, virtues, guiding principles, and culture that one has worked hard to instill. Throughout his 30-year career, Jeff Rogers has helped clients in gifting over $800 million, but he has a grander mission: to shepherd their values along with their assets on to the next generation. His new book condenses his decades of experience into a succinct guide for those with more to give than just affluence. Create a Thriving Family Legacy outlines Rogers' process of combining effective Wealth Transfer with intentional Wisdom Transfer. Readers will learn not only how to best manage their financial legacy, but how to create a legacy of values that echoes out across generations. "We are accomplishing much more than just showing financially blessed people how they can give more to charity or just build 'bigger barns,'" said Rogers. "We are showing them how to build strong families of enduring character." Create a Thriving Family Legacy: How to Share Your Wisdom and Wealth with Your Children and Grandchildren is available now on . Jeff is the Founder and Chairman of Stewardship Legacy Coaching and Stewardship Advisory Group. He has over 30 years of experience in helping financially-blessed families build strong and lasting family legacies. He has a heartfelt focus in the specialized areas of Family Legacy Coaching, Zero Estate Tax Planning, and Business Legacy Coaching. To learn more visit . Launched in 2016 in partnership with Advantage Media Group, ForbesBooks is the exclusive business book pubishing imprint of Forbes Media. Reaching more than 120 million people each month, Forbes is among the most respected names in business media. From the flagship magazine, with its 40 print editions in 70 countries and 28 languages, to Forbes.com and its 67 million unique monthly visitors, Forbes champions success worldwide. ForbesBooks offers business and thought leaders an innovative, speed-to-market publishing model and a suite of services designed to strategically and tactically support authors and promote their expertise. For more information, visit .